Geometry is one of the important part of mathematics. The following picture will help us to get the idea about point. 1. Draw a straight path from Sam’s house to the school. 2. Draw a straight path from the factory to the hospital. 3. Write A at the place where the paths cross. 4. The place where the paths cross in a point. We can use a small dot to make a picture of a point A. When two lines meet we get a point. 5. Observe the picture of the path drawn below. We have shown a point on this path. The name of this point is T.
6. Show another point on the same path. 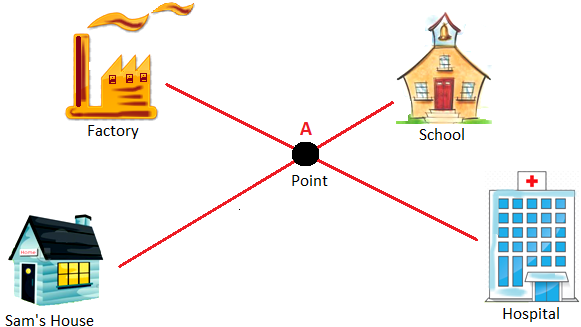 Name it point P.
There are two paths shown through the point A and B. The point l follows the shortest distance from A and B. It is a line. We name a line by two of its points. We may write the name for the straight line l as AB. The other line m is a curve. The line segment AB is a part of the line p. A line segment stops while a line does not stop. The line goes on and on in both directions. That is why it is shown by two arrows. We will observe how the picture looks like when the curve is closed and when it is not. This curve is not closed. We will observe how the picture looks like when the objects are inside and outside the closed figure. Objects are inside the closed figure. Objects are outside the closed figure.